Photo courtesy of Sam Vasfi Photography. Sometimes you need to completely give in to your inner girl. Kat Bangs understands. Not only is she the very talented sommelier at Komi, she’s got an eye for fun fashion that I seriously envy. Join her monthly Flower Cocktail Hour with the next gathering on Wednesday, October 6. 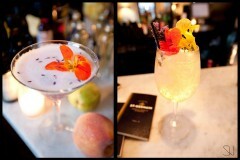 From 6:30pm to 8:30pm you can relax at The Gibson’s upstairs marble bar enjoying delectable floral cocktails crafted by Jon Harris, while also learning how to construct wearable flower art. Email flower.cocktail.hour@gmail.com for reservations ($48). I was lucky to attend last month’s flower hour and it was simply beautiful – the bar brimming with various flowers and greenery to choose from in stunning colors – featuring informal tutorials on how to make your own floral headbands and boutonnieres (the truly intrepid sported epaulettes! ), or even just a simple handheld posy. Mmmm… the perfect antidote to midweek dreariness. Get girly.